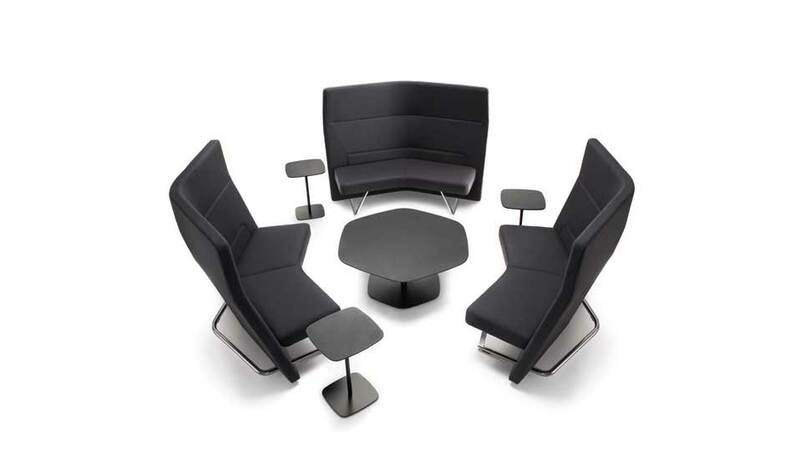 Modern office furniture is, at its heart, about individual style. Though function plays a key role in the office design, modern office furniture showcases a company’s values by the environment it creates and the mood it generates. Modern office furniture can convey different environmental moods through color. For instance, studies have proven that the color green motivates people to be more productive, while blue shades have a calming effect. 1. White with Wood Tones. Modern offices all over the world embrace the widespread appeal of minimalist design, as exemplified by the popularity of white modern office furniture. White office furniture embodies a “futuristic” appeal, and immediately cues visitors that they are in a place that values progress and order. The dark wood tones that accent these white glass office desks and white office storage shelves offer a striking visual contrast, but also infuse the modern office furniture with a natural touch. 2. Dark Wood Tones with Chrome or Glass. This modern office color trend is a high-level executive look, and exudes power. From the deep colors to the sleek chrome or matte glass accents, these elements work together to create an elegant, dramatic impression. Modern office desks utilizing these high-contrast, saturated colors create a sense of leadership due to their boldness and depth. The prominent mocha-colored glass draws the eye to the executive office’s focal point: the desk. Anyone who walks into this office knows to find true direction here. 3. Pops of Vibrant Colors. In open office workstations, gone are the days of high-walled cubicles. Instead, today’s modular workstations inspire collaboration with lower walls and let in more air and natural light. Modular workstations also invoke a sense of collaboration through their color schemes. Pops of bright colors—such as tangerine orange, apple green, and daffodil yellow—contrast against neutral tones, such as white. The result is a truly modern feel, and a certain charm that portrays forward thinking and openness.